Daniel 1:8-9 "But Daniel made up his mind that he would not defile himself with the king’s choice food or with the wine which he drank; so he sought permission from the commander of the officials that he might not defile himself. 9 Now God granted Daniel favor and compassion in the sight of the commander of the officials." I wanted to begin today's post with a quotation from 1 Peter 2:9-12 "But you are a chosen race, a royal priesthood, a holy nation, a people for God’s own possession, so that you may proclaim the excellencies of Him who has called you out of darkness into His marvelous light;10 for you once were not a people, but now you are the people of God; you had not received mercy, but now you have received mercy. 11 Beloved, I urge you as aliens and strangers to abstain from fleshly lusts which wage war against the soul. 12 Keep your behavior excellent among the Gentiles, so that in the thing in which they slander you as evildoers, they may because of your good deeds, as they observe them,glorify God in the day of visitation." Peter's point is to remind the Christian of the fact that they are "strangers" and "pilgrims" passing through this world. Such a theme is not unique to Peter, since his statements - under Divine inspiration of the Holy Spirit - are taken directly from what Moses wrote in Exodus 19 and other Old Testament passages. Hebrews 11 takes this theme of "strangers and pilgrims" and shows how patriarchs such as Abraham, men such as Joseph and then prophets such as Daniel exhibited this mindset as they journeyed by faith to "the city whose builder and maker is God" (John 14:1-3; Hebrews 11:10-16). Today's post features one of these figures, Daniel, and how he demonstrated faith at work in a foreign land. The longer I walk with Jesus, the more estranged I feel from this world's system and the more I pine to get to that Heavenly home. Daniel illustrates in real life what Peter and other Biblical writers wrote frequently about - namely faith at work in the foreign land of this age. As Daniel and his friends were brought into Babylon, they were already endowed by God with character, blamelessness, wisdom and insight from God (Daniel 1:4). Although these young men were in their teens, they operated in a level of faith beyond their years. Unless we have been captured by the glory of God and the endless beauty of the Lord Jesus Christ, we won't begin the fight to reject the world nor persist in such an endeavor. Daniel and his friends were given opportunities to live at ease in the royal courts of Babylon, imbibing in feasting and drinking and changing their language from their native Hebrew to Babylonian Aramaic. Despite the pressure placed upon them to conform, Daniel 1:8 is perhaps the tipping point in the chapter: "But Daniel made up his mind". Following that resolve, we see God injecting Daniel and his friends with further favor and compassion from the Babylonians (1:9) and knowledge (1:17). Daniel was already walking in grace. He had held position and went through process in his current level of grace. The level of faith he had was his measure of light to go by - all provided by God. By having passed the test of Nebuchadnezzars' offers of the easy life, God granted Daniel and his friends the greater measure of faith and grace they would need to handle the tests of success as well as the trials of the furnace (Daniel 3) and the much later lion's den (Daniel 6). 2. True faith relies upon the word of God (2:1-20). d. The Eternal Kingdom of Jesus Christ represented as a stone smashing the statue. Daniel 2:44-45. Nebuchadnezzar's statue or colossus represents the system of unbelief and Satanically inspired, man-made rebellion called "the world". Daniel's faith thrives in a foreign land because of his reliance upon the Word of God. Those prophetic visions gave Daniel the needed perspective on the fleeting duration of this world and the enduring Sovereignty of God. 3. True faith revolves around Jesus Christ. Daniel 1:21 has this note - "And Daniel continued until the first year of Cyrus the king." This short statement refers to the total time Daniel would be in Babylon - at least 70 years. 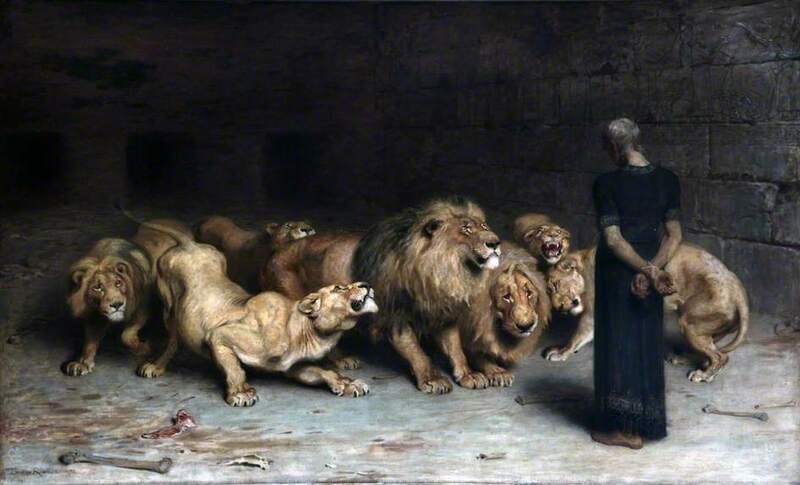 So did Daniel's faith hold out for the 70 years that elapsed from his arrival in Daniel 1-2 until we come to the scene of the Lion's Den in Daniel 6? In Daniel 6, a new King, a new Empire and many of Daniel's enemies had died off. New opponents had arisen who hated Daniel just as much, if not moreso than the old enemies. These new villains tricked King Darius into signing an edict that would result in the Lion's Den for anyone refusing to worship the king. Though Daniel knew of the edict, his faith did not waver. In Daniel 6:10 we read - "Now when Daniel knew that the document was signed, he entered his house (now in his roof chamber he had windows open toward Jerusalem); and he continued kneeling on his knees three times a day, praying and giving thanks before his God, as he had been doing previously." How many of us would continue persevering in faith, knowing full-well that "documents had been signed" that could end our lives? Daniel's faith was not looking at the situation around him brought about by a king in Persia but rather towards the city of the Great King. Daniel orientated his life around God's precious promises which pointed Him towards the Lord Jesus Christ. Now some may wonder how we get to Jesus from Daniel 6? Consider the logic of Hebrews 11:33 for just a moment - "who by faith conquered kingdoms, performed acts ofrighteousness, obtained promises, shut the mouths of lions." Within that same sequence of verses in Hebrews 11, we note how Moses had chosen the reproaches of Christ over the comforts of sin for a season (Hebrews 11:25-26). Much like Moses, Daniel feared not the wrath of a king, but rather chose to set his eyes of faith upon Him who is unseen (compare Hebrews 11:27 to Hebrews 11:33). The unseen One whom Daniel looked to was none other than the Lord Jesus Christ. The logic of Hebrews 11 is at work in Daniel 6. Although Daniel may not had possessed the 20/20 perspective afforded to us by Hebrews 11, the resolve and direction of His faith is as accurate in terms of what His trust is anchored to (Hebrews 6:18-20). As 21st century Christians we are reminded in Hebrews 12:1-3 "Therefore, since we have so great a cloud of witnesses surrounding us, let us also lay aside every encumbrance and the sin which so easily entangles us, and let usrun with endurance the race that is set before us, 2 fixing our eyes on Jesus, the author and perfecter of faith, who for the joy set before Him endured the cross,despising the shame, and has sat down at the right hand of the throne of God. 3 For consider Him who has endured such hostility by sinners against Himself, so that you will not grow weary and lose heart." 1. True faith rejects worldliness.